Music lovers, families, lovers of the lake and its natural beauty are invited to enjoy the 2019 Lake-a-Palooza! Music Festival on the shores of White Rock Lake. The event is on April 27 from noon until 9 p.m. The Bath House Cultural Center (BHCC) has long stood for arts in East Dallas. 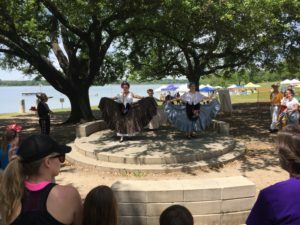 Anita Martinez and Ballet Folklorico performing at the 2018 Lake-a-Palooza event. Along with its support for local and regional theatrical performances and art exhibitions, promoting great local music is a primary focus of the BHCC. The festival features special musical guests Urban Gypsy, featuring original Toadies members Lisa Umbarger and Charles Mooney III. Food, wine and beer will be available for purchase. Free children’s and family activities will take place throughout the day. Lake-a-Palooza! is produced by The Friends of the Bath House for the benefit of everyone in Dallas. The Bath House is located at 521 E. Lawther Drive in Dallas. For more information, visit friendsofthebathhouse.org.